Staging 7.30 to 9.00 p.m. on Saturday 17th and Sunday morning until 10.00 pm. Schedules will be sent to all previous exhibitors. Why not consider entering and enjoying a day out a day out in North Devon? You will be most welcome. The area is delighted that Terry has agreed to be our speaker this year. A plant, tuber and foliage sale of named varieties will also take place. Venue: Grove Sports Centre, St Mary’s Grove, Nailsea, North Somerset, BS48 2NQ. Just off junctions 19 or 20, M.5. There will be the usual Sunday lunch at "The Moorend Spout" prior to the meeting . For bookings, please contact Tel: 01275 855675 or email Basil Billinger. Nick Langdon has kindly agreed to open the nursery to members on 14th April, the day of meeting, until twelve noon. Take advantage of the opportunity to purchase at sale prices prior to their open weekend on the 3/4/5th May. See how the Chelsea Flower Show plants are progressing. Staging 7.30 to 9.00 p.m. on Saturday 18th and Sunday morning until 10.00 am. Why not consider entering and enjoying a day out in North Devon? You will be most welcome. The area is delighted that Michael Richardson has agreed to be our speaker this year. Mike is a noted exhibitor with many innovative methods of growing. Also, plant and tuber sale of named varieties. Grove Sports Centre, St Mary’s Grove, Nailsea, North Somerset, BS48 2NQ. Just off junctions 19 or 20, M.5. There will be the usual Sunday lunch prior to the meeting . For bookings, please telephone Tony Willoughby 01275 854035. Blackmore & Langdon Sale and South West Area meeting. 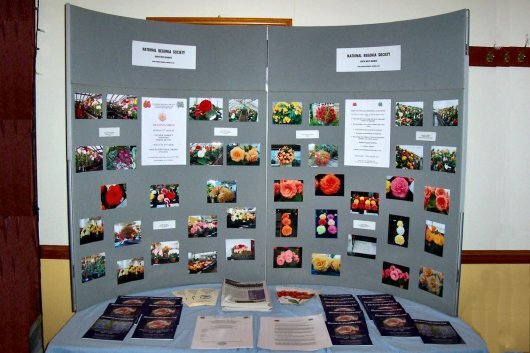 for members' of The National Begonia Society. Most stock will be reduced, some by at least 50%, all started, all grown in pots. Non Members' will be able to join on the day. There will N B S membership forms available. Membership, is presently £18 for the year. Once joined, you will receive a N B S handbook free of charge, plus three N B S bulletins yearly. Why not take advantage of this unique opportunity. You will save more than the joining fee!! Blackmore & Langdon, are now able to sell many named varieties, which previously were not available from their nursery, including the rarer, hard to obtain varieties. Venue. The Grove Sports Centre, Saint Mary's Grove, Nailsea BS 48 2NQ. Time, 2 :00 P M.
At 12:00 Noon, prior to the talk, members' are invited to The Moorend Spout Public House for Sunday Dinner. To book your meal, contact Tony Willoughby, tel: 01275 854035, or Gary Dando tel 01761 432739. Speaker. Michael Richardson, past Winner of The National 12 Cut Bloom Championship, will disclose his methodology of how to grow Championship - class blooms. Not to be missed. Our very good friend and exhibitor for over 50 years, David Elliott lost his fight to Prostrate Cancer on Monday 1st January. His love and growing of Begonias, both Tuberous and Species extends back over all those years having been encouraged by his cousin Cecil Gammon. 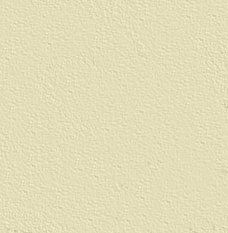 His support of the South West Begonia Show and indeed visits to the National when he was fit enough has been unstinted. Even in the last two years when it has been a struggle to get plants together he still exhibited right up to 2016 show. His other loves of Chrysanthemums, Dahlias and Vegetables made him a very significant exhibitor in our locality and indeed further afield too. I've personally known Dave for over 60 years dating back to schooldays and employing his skills as a plumber and electrician. Clearly the shows will be missing a much loved and respected stalwart. Staging 7.30 to 9.00 pm on Saturday 19th and Sunday morning until 10.00 am. Why not consider entering and enjoying a day out a day out in North Devon? Joint meeting in conjunction with South Wales Area. Sunday 2nd. April 1.30 - 5.30pm. 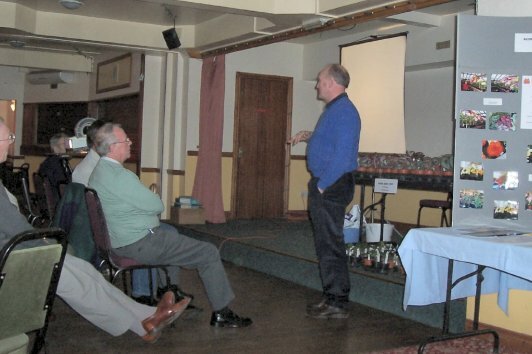 John Hamilton, the renowned Scottish grower, will give a presentation to a joint meeting with South Wales Area. 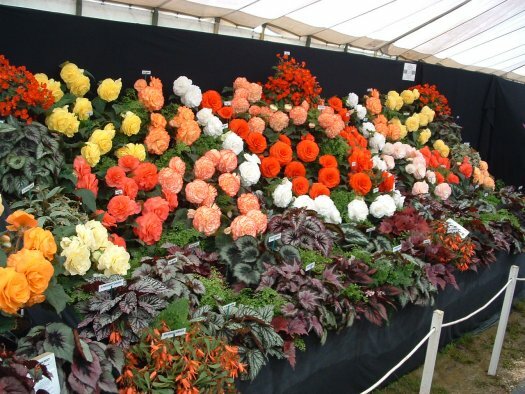 John Chiswell will hopefully have available some of his choice begonias. A few minutes off junction 24 of the M4, less than 10 minutes from the Severn Bridge and an hour from the Midlands. which is located 100 yards from the meeting venue. Meet sharp at 11.45 a.m.to enable seating together. The area is delighted that Rosemary Langdon of Blackmore and Langdon has agreed to give a talk to members. Followed by pictures of 2016 shows by John Chiswell. There will be the usual Sunday lunch prior to the meeting at the Moorend Spout, Kingshill, Nailsea BS48 2BB at 12 noon prompt. BIDEFORD SHOW The Pannier Market, Bideford. Samuel and Elizabeth Kennedy from the Scottish Begonia Society. Further details will be advised. Also, plant and tuber sale of named varieties. Venue: Grove Sports Centre, St Mary’s Grove, Nailsea, North Somerset, BS48 2NQ. Just off junctions 19 or 20, M.5. Sunday 29th March at 2.30 p.m. Both areas are delighted to welcome Ian Donaldson, Scottish Bloom Champion. Venue: Grove Sports Centre, St Marys Grove, Nailsea, North Somerset, BS48 2NQ. Just off junctions 19 or 20, M.5. It with deep regret that I report the passing of Don on Saturday 14th June after a short illness. Don lived in Little Stoke, South Gloucestershire and had grown, shown and judged chrysanthemums for over forty years before transferring his allegiance to begonias eight years ago. He had exhibited from time to time at shows at Bideford, North Devon and also at Portchester on the South Coast. Don loved visiting shows and attended on a regular basis the National, when it was held at King’s Heath, Birmingham and also the South Wales Show at Swansea. His great love was visiting other growers and their greenhouses and talking “all things begonia”. 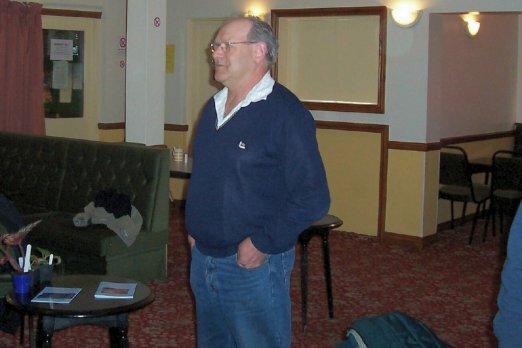 Many in the South West will miss him greatly and we extend and our sympathy and condolences to his family and friends. Sunday 6th. April at 2.30 p.m.
St Mary's Grove, Nailsea, North Somerset, BS48 2NQ. Just off junctions 19 or 20, M.5. Speaker Ian Rhys Williams. Plant and tuber sale of named varieties. Venue: Grove Sports Centre, St Mary's Grove, Nailsea, North Somerset, BS48 2NQ. Just off junctions 19 or 20, M.5. Sunday 25th March 2.30pm . Dave Coates, current National Champion will be our guest speaker. Plus, plant & tuber sale of named varieties. Sunday 3rd. April 2.15pm . Bob Bryce, top pot & bloom grower will be the Speaker. Also plant & tuber sale of named varieties. Illustrated talk by top grower and exhibitor, Jack Larter. Lessons with tips we can all learn from. Followed by a plant and tuber sale of named varieties. Sunday 5th. April 2.30pm Speaker Dennis Need Followed by Plant Sale. 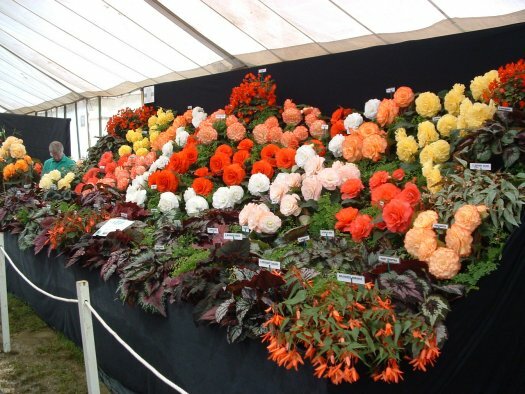 Talk by John Taylor “Begonias – My Way” followed by a plant sale. The first Area meeting under the stewardship of our newly appointed Area Representative, Gary Dando, took place at Grove Sports Centre, Nailsea, North Somerset on Sunday 6th. April. 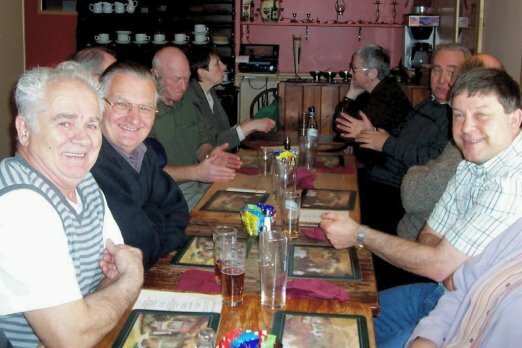 Some member met up for lunch prior and around 40 attended the meeting. Many travelled some considerable distance, a round trip of over 400 miles for some. It was evidently well worth the effort. 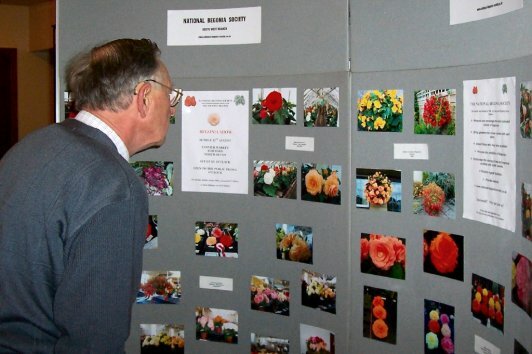 John Taylor gave a talk on “Growing begonias – his way”. 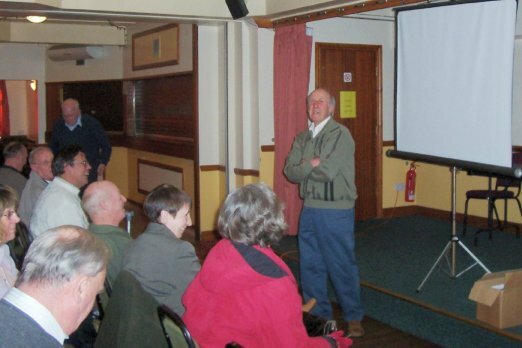 After a break for the plant/tuber sale John followed this up with some slides of his recent visits to New Zealand. The begonias were absolutely stunning, in particular the pendulas. The round of applause following John’s talk was completely spontaneous and well deserved. John was accompanied by Dave Staines and Mags and their willingness to travel such a distance has set the Area up for the future. The next event is the Area Show that takes place on Sunday 10th August at The Pannier Market, Bideford, North Devon. Left to right - Pre -meeting Lunch. South West Area Display Board. John Taylor Addresses the Audience Plant Sale. 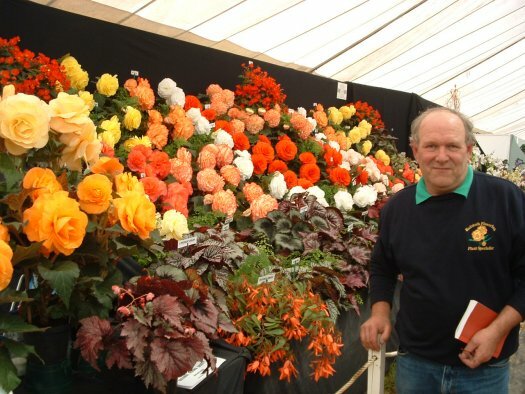 Guest Speaker John Chiswell, National Blooms Champion 2006 - "The Begonia year" covers all aspects of growing. Followed by a Plant Sale of John's named varieties. Grove Sports Centre, Nailsea, North Somerset. Only 10 minutes off junction either 19 or 20 of the M5. Approximately 40 people came along including Andrew MacDougall’s party from Birmingham to give support, 2 from across the water in Wales and 12 locals brought in by local advertising and press coverage. 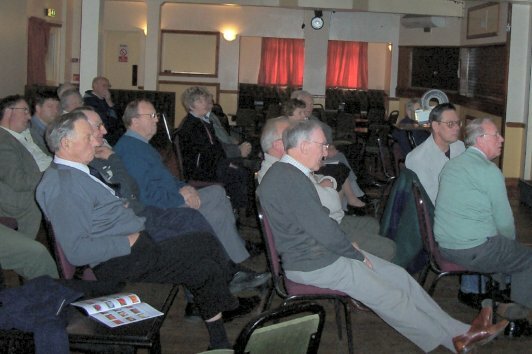 The rest were SW members who travelled from as far a field as Kingsteignton, Exeter and Tiverton in Devon and from Taunton and the Mendip area in Somerset as well as some more local members. John’s talk was entitled “The Begonia Year” and covered all aspect of John’s inventive and at times different methods of growing. Besides his prize winning begonias he also gave a snapshot of his previous successes with chrysanthemums. 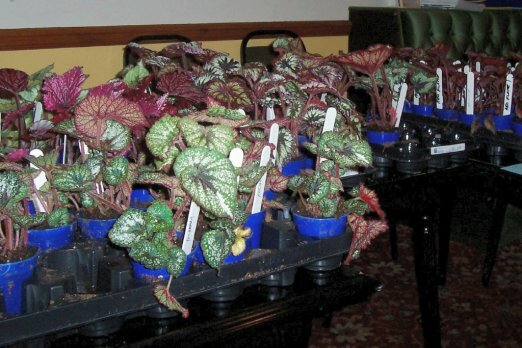 It was very well received indeed and members were able to obtain Show and Rex Begonia plants that John had brought along. 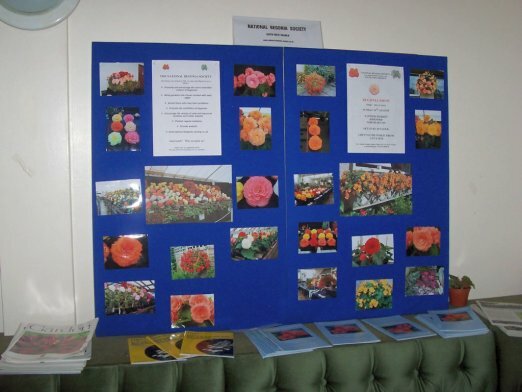 The attendance of 40, Speaker John Chiswell, SW Display board featuring National & SW Shows 2006, Blackmore & Langdon, Bellcross Nurseries and local greenhouses and gardens.